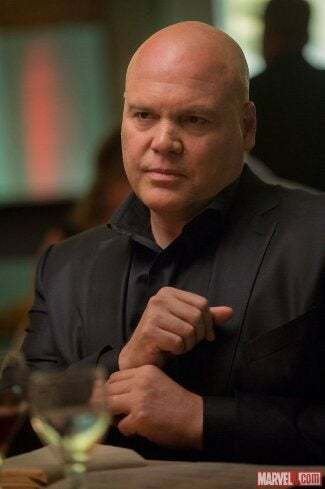 The first look at Vincent D'onofrio as Wilson Fisk, the villain of Marvel and Netflix's upcoming Daredevil TV show better known as the Kingpin, has arrived. Sure, the Kingpin is just a big, bulky, bald dude, but even in this still you can see the gravitas and presence D'Onofrio exudes as the crimelord. The shadowy figure behind organized crime in Hell's Kitchen, Wilson Fisk has one mission in mind: to save Hell's Kitchen by any means necessary, no matter the cost. This immediately puts him at odds with Matt Murdock's vigilante alter-ego, who also seeks to protect the city – but sees the criminal element as the root of the city's problems. Central to this conflict is that Fisk truly believes he's doing good for Hell's Kitchen and at times may seem more of a hero to its people than Daredevil. Intelligent, complex and physically imposing, Wilson Fisk is the perfect foil for Matt Murdock, and the two will collide dramatically in Marvel's Daredevil. In the comics, Fisk is pretty much just interested in crime, so this is a pretty fascinating take. It'll be cool to see the two foes trying to save Hell's Kitchen by two different means. Admittedly, I'm kind of bummed D'Onofrio isn't wearing the Kingpin's traditional white suit and purple ascot, but I'm betting Marvel is trying to keep things grounded in comparison to the Daredevil movie, and I can't really blame them for that.